Six year old Susan has doubts childhood’s most enduring miracle Santa Clause. Her mother told her the “secret” about Santa a long time ago, so Susan doesn’t expect to receive the most important gifts on her Christmas list. But after meeting a special department stare Santa who’s convinced he’s the real thing, Susan is given the most precious gift of all – something to believe in. Where are the traditional Christmas shows? I totally agree, I’ve not found any traditional christmas movies and I have spectrum cable. Shame on the stations for not having the traditional christmas movies. It doesn’t feel like christmas without those. I agree not everyone has Cable i would love to see the original here in the Detroit area. can you please tell me if “Miracle on 34th st.” will be aired at all this 2016 holiday season? ?…thz..god bless. White Christmas, All the Old Original Movies we knew as youngsters. With what I pay for TV Christmas Movies should be shown around Christmas. When will Miracle on 34th Street be airing on AMC Channel? The old Christmas movies are the best and what we were raised on! It’s very sad for the younger generation not to be able to see, enjoy and learn the magic of Miracle on 34th Street, The Bells of St. Marys, and so many more with Bing Crosby and Danny Kaye!!! Bring them back!!! I don’t think this page even reads our comments. Except for us that post it goes unanswered, I posted on FB and sent to Public just to air my displeasure in this seasons line up. It’s a real shame, I remember when you couldn’t decide what to watch cause they were on all the same time, but at least they were on. Boomerang has a lot of the cartoons but if you don’t pay for it you can’t get them. This is by far the best Christmas movie ever made. I have watched it so many times each Christmas I know the dialogue by heart. It puts you in that old fashioned Christmasy feeling. I wish things were like that today. 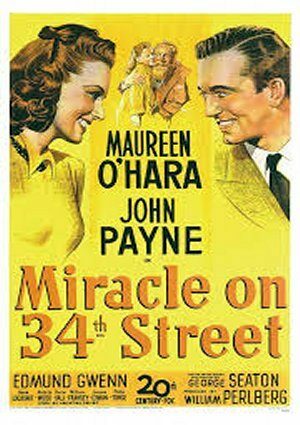 I am glad Miracle on 34 Street (1947)will be aired, but disappointed that it is only on once while other shows are constantly being repeated. It was not on last year which was totally wrong. What happened to all the good old movies and cartoons. It’s a shame, if you have any control could you please put it on more this season? I WANT TO SEE ALL THE OLD CHRISTMAS MOVIES….NOT REMAKES BY CRACK HEADS!!!!! I still don’t see the original Miracle on 34th Street listed???? where does Miracle on 34th Street air this year….. 2016??? Love the old Christmas movies. Please air them. Where is the original Miracle on 34th Street? I can’t believe it’s not on! what has happened to our beautiful Older Christmas movies?? Who made such a decision to take ALL of them off the air? and Miracle on 34th Street (the older version especially) can’t even be found on Netflix or anywhere except to buy it! I’m sorry, but BUYING the movie, jsut isn’t the same as knowing these old favorites will be on TV during the Holidays! There are other Hallmark older movies that show the tru meaning of Christmas – not like these newer movies that are just heart throb stories! Where is “Miracle on 34th Street”, “Holiday Inn”, “It’s a Wonderful Life”….???? We agree Joanie, hoping it gets added last minute. That’s why I can’t find this movie. I look forward every year to watching this movie. Please will someone show this on T.V. AMC, where are you. My family is very disappointed that the original “Miracle on 34th Street” i doesn’t appear to be on this year (2013). It was old when I was a child but still a great classic.